Presenilin-1 (PS-1) is a presenilin protein that in humans is encoded by the PSEN1 gene. Presenilin-1 is one of the four core proteins in the gamma secretase complex, which is considered to play an important role in generation of amyloid beta (Aβ) from amyloid precursor protein (APP). Accumulation of amyloid beta is associated with the onset of Alzheimer's disease. Presenilin possesses a 9 transmembrane domain topology, with an extracellular C-terminus and a cytosolic N-terminus. Presenilin undergoes endo-proteolytic processing to produce ~27-28 kDa N-terminal and ~16-17 kDa C-terminal fragments in humans. Furthermore, presenilin exists in the cell mainly as a heterodimer of the C-terminal and N-terminus fragments. When presenilin 1 is overexpressed, the full length protein accumulates in an inactive form. Based on evidence that a gamma-secretase inhibitor binds to the fragments, the cleaved presenilin complex is considered to be the active form. Presenilins are postulated to regulate APP processing through their effects on gamma secretase, an enzyme that cleaves APP. Also, it is thought that the presenilins are involved in the cleavage of the Notch receptor, such that they either directly regulate gamma secretase activity or themselves are protease enzymes. Multiple alternatively spliced transcript variants have been identified for this gene, the full-length natures of only some have been determined. In Notch signaling, critical proteolytic reactions takes place during maturation and activation of Notch membrane receptor. Notch1 is cleaved extracellularlly at site1 (S1) and two polypeptides are produced to form a heterodimer receptor on the cell surface. After the formation of receptor, Notch1 is further cleaved in site 3(S3) and release Notch1 intracellular domain (NICD) from the membrane. Presenilin 1 has been shown to play an important role in proteolytic process. In the prenilin 1 null mutant drosophila, Notch signaling is abolished and it displays a notch-like lethal phenotype. Moreover, in mammalian cells, deficiency of PSEN1 also causes the defect in the proteolytic release of NICD from a truncated Notch construct. The same step can be also blocked by several gamma-secretase inhibitors, shown in the same study. These evidences collectively suggest a critical role of presenilin 1 in the Notch signaling pathway. Wnt signaling pathway has been shown to be involved in several critical steps in embryogenesis and development. Presenilin 1 has been shown to form a complex with beta-catenin, an important component in Wnt signaling, and stabilize beta-catenin. Mutant of presenilin-1 that reduces the ability to stabilize beta-catenin complex leads to hyperactive degradation of beta-catenin in the brains of transgenic mice. Considered as a negative regulator in wnt signaling pathway, presenilin-1 was also found to play a role in beta-catenin phosphorylation. Beta-catenin is coupled by presenilin-1 and undergoes a sequential phosphorylation by two kinase activities. The study also further illustrates that the deficiency of presenilin 1 disconnects the sequential phosphorylation and thus disrupts the normal wnt signaling pathway. Transgenic mice that over-expressed mutant presenilin-1 show an increase of beta-amyloid-42(43) in the brain, which suggest presenilin-1 plays an important role in beta-amyloid regulation and can be highly related to Alzheimer's disease. Further study conducted in neuronal cultures derived from presenilin-1 deficient mouse embryos. They showed that cleavage by alpha- and beta- secretase was still normal without the presence of presenilin-1. Meanwhile, the cleavage by gamma-cleavage of the transmembrane domain of APP was abolished. A 5-fold drop of amyloid peptide was observed, suggesting that deficiency of presenilin-1 can down regulate amyloid and inhibition of presenilin-1 can be a potential method for anti-amyloidogenic therapy in Alzheimer's disease. Extensive study on the role of presenilin-1 in amyloid production has been conducted to improve our understanding of Alzheimer's disease. Alzheimer's disease (AD) patients with an inherited form of the disease may carry mutations in the presenilin proteins (PSEN1; PSEN2) or the amyloid precursor protein (APP). These disease-linked mutations result in increased production of the longer form of amyloid beta (main component of amyloid deposits found in AD brains). These mutations result in early-onset Alzheimer's Disease, which is a rare form of the disease. These rare genetic variants are autosomal dominant. In addition to its role in Alzheimer's disease, presenilin-1 also found to be important in cancer. 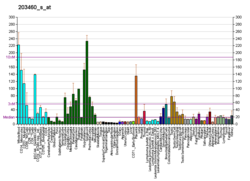 A study of broad range gene expression was conducted on human malignant melanoma. Researchers classified the malignant melanoma cell lines into two types. The study showed that presenilin-1 is down regulated in cell type while it is overexpressed in the other cell type. Another study on multidrug resistance (MDR) cell line also reveals a role of presenilin-1 in cancer development. Because of the development to the resistance to chemical, MDR cells become a critical factor on the success of cancer chemotherapy. In the study, researchers tried to explore the molecular mechanism by looking into the expression of Notch1 intracellular (N1IC) domain and presenilin 1. They found that there is higher level expression of both proteins and a multidrug resistance-associated protein 1 (ABCC1) was also found to be regulated by N1IC, which suggest a mechanism of ABCC1 regulated by presenilin 1 and notch signaling. ^ Schellenberg GD, Bird TD, Wijsman EM, Orr HT, Anderson L, Nemens E, White JA, Bonnycastle L, Weber JL, Alonso ME (Nov 1992). "Genetic linkage evidence for a familial Alzheimer's seasesease locus on chromosome 14". Science. 258 (5082): 668–71. Bibcode:1992Sci...258..668S. doi:10.1126/science.1411576. PMID 1411576. ^ Selkoe DJ (1994). "Cell biology of the amyloid beta-protein precursor and the mechanism of Alzheimer's disease". Annu. Rev. Cell Biol. 10: 373–403. doi:10.1146/annurev.cb.10.110194.002105. PMID 7888181. ^ Laudon H, Hansson EM, Melén K, Bergman A, Farmery MR, Winblad B, Lendahl U, von Heijne G, Näslund J (October 2005). "A nine-transmembrane domain topology for presenilin 1". J. Biol. Chem. 280 (42): 35352–60. doi:10.1074/jbc.M507217200. PMID 16046406. ^ Spasic D, Annaert W (February 2008). "Building gamma-secretase: the bits and pieces". J. Cell Sci. 121 (Pt 4): 413–20. doi:10.1242/jcs.015255. PMID 18256384. ^ a b Thinakaran G, Borchelt DR, Lee MK, Slunt HH, Spitzer L, Kim G, Ratovitsky T, Davenport F, Nordstedt C, Seeger M, Hardy J, Levey AI, Gandy SE, Jenkins NA, Copeland NG, Price DL, Sisodia SS (July 1996). "Endoproteolysis of presenilin 1 and accumulation of processed derivatives in vivo". Neuron. 17 (1): 181–90. doi:10.1016/S0896-6273(00)80291-3. PMID 8755489. ^ Ratovitski T, Slunt HH, Thinakaran G, Price DL, Sisodia SS, Borchelt DR (September 1997). "Endoproteolytic processing and stabilization of wild-type and mutant presenilin". J. Biol. Chem. 272 (39): 24536–41. doi:10.1074/jbc.272.39.24536. PMID 9305918. ^ Li YM, Xu M, Lai MT, Huang Q, Castro JL, DiMuzio-Mower J, Harrison T, Lellis C, Nadin A, Neduvelil JG, Register RB, Sardana MK, Shearman MS, Smith AL, Shi XP, Yin KC, Shafer JA, Gardell SJ (June 2000). "Photoactivated gamma-secretase inhibitors directed to the active site covalently label presenilin 1". Nature. 405 (6787): 689–94. doi:10.1038/35015085. PMID 10864326. ^ Brunkan AL, Martinez M, Walker ES, Goate AM (May 2005). "Presenilin endoproteolysis is an intramolecular cleavage". Mol. Cell. Neurosci. 29 (1): 65–73. doi:10.1016/j.mcn.2004.12.012. PMID 15866047. 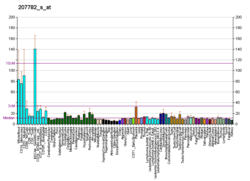 ^ "Entrez Gene: PSEN1 presenilin 1 (Alzheimer disease 3)". ^ Chan YM, Jan YN (August 1998). "Roles for proteolysis and trafficking in notch maturation and signal transduction". Cell. 94 (4): 423–6. doi:10.1016/S0092-8674(00)81583-4. PMID 9727485. ^ Logeat F, Bessia C, Brou C, LeBail O, Jarriault S, Seidah NG, Israël A (July 1998). "The Notch1 receptor is cleaved constitutively by a furin-like convertase". Proc. Natl. Acad. Sci. U.S.A. 95 (14): 8108–12. Bibcode:1998PNAS...95.8108L. doi:10.1073/pnas.95.14.8108. PMC 20937. PMID 9653148. ^ Schroeter EH, Kisslinger JA, Kopan R (May 1998). "Notch-1 signalling requires ligand-induced proteolytic release of intracellular domain". Nature. 393 (6683): 382–6. Bibcode:1998Natur.393..382S. doi:10.1038/30756. PMID 9620803. ^ Jarriault S, Brou C, Logeat F, Schroeter EH, Kopan R, Israel A (September 1995). "Signalling downstream of activated mammalian Notch". Nature. 377 (6547): 355–8. Bibcode:1995Natur.377..355J. doi:10.1038/377355a0. PMID 7566092. ^ Struhl G, Greenwald I (April 1999). "Presenilin is required for activity and nuclear access of Notch in Drosophila". Nature. 398 (6727): 522–5. Bibcode:1999Natur.398..522S. doi:10.1038/19091. PMID 10206646. ^ De Strooper B, Annaert W, Cupers P, Saftig P, Craessaerts K, Mumm JS, Schroeter EH, Schrijvers V, Wolfe MS, Ray WJ, Goate A, Kopan R (April 1999). "A presenilin-1-dependent gamma-secretase-like protease mediates release of Notch intracellular domain". Nature. 398 (6727): 518–22. Bibcode:1999Natur.398..518D. doi:10.1038/19083. PMID 10206645. ^ a b Zhang C, Wu B, Beglopoulos V, Wines-Samuelson M, Zhang D, Dragatsis I, Südhof TC, Shen J (July 2009). "Presenilins are essential for regulating neurotransmitter release". Nature. 460 (7255): 632–6. Bibcode:2009Natur.460..632Z. doi:10.1038/nature08177. PMC 2744588. PMID 19641596. ^ a b c Kang DE, Soriano S, Xia X, Eberhart CG, De Strooper B, Zheng H, Koo EH (September 2002). "Presenilin couples the paired phosphorylation of beta-catenin independent of axin: implications for beta-catenin activation in tumorigenesis". Cell. 110 (6): 751–62. doi:10.1016/S0092-8674(02)00970-4. PMID 12297048. ^ Duff K, Eckman C, Zehr C, Yu X, Prada CM, Perez-tur J, Hutton M, Buee L, Harigaya Y, Yager D, Morgan D, Gordon MN, Holcomb L, Refolo L, Zenk B, Hardy J, Younkin S (October 1996). "Increased amyloid-beta42(43) in brains of mice expressing mutant presenilin 1". Nature. 383 (6602): 710–3. Bibcode:1996Natur.383..710D. doi:10.1038/383710a0. PMID 8878479. ^ De Strooper B, Saftig P, Craessaerts K, Vanderstichele H, Guhde G, Annaert W, Von Figura K, Van Leuven F (January 1998). "Deficiency of presenilin-1 inhibits the normal cleavage of amyloid precursor protein". Nature. 391 (6665): 387–90. Bibcode:1998Natur.391..387D. doi:10.1038/34910. PMID 9450754. ^ Pitsi D, Octave JN (June 2004). "Presenilin 1 stabilizes the C-terminal fragment of the amyloid precursor protein independently of gamma-secretase activity". J. Biol. Chem. 279 (24): 25333–8. doi:10.1074/jbc.M312710200. PMID 15087467. ^ Phiel CJ, Wilson CA, Lee VM, Klein PS (May 2003). "GSK-3alpha regulates production of Alzheimer's disease amyloid-beta peptides". Nature. 423 (6938): 435–9. Bibcode:2003Natur.423..435P. doi:10.1038/nature01640. PMID 12761548. ^ Mayeux R, Stern Y (2012). "Epidemiology of Alzheimer disease". Cold Spring Harbor Perspectives in Medicine. 2 (8). doi:10.1101/cshperspect.a006239. PMC 3405821. PMID 22908189. ^ Su DM, Zhang Q, Wang X, He P, Zhu YJ, Zhao J, Rennert OM, Su YA (May 2009). "Two types of human malignant melanoma cell lines revealed by expression patterns of mitochondrial and survival-apoptosis genes: implications for malignant melanoma therapy". Mol. Cancer Ther. 8 (5): 1292–304. doi:10.1158/1535-7163.MCT-08-1030. PMC 3128982. PMID 19383853. ^ Gottesman MM, Fojo T, Bates SE (January 2002). "Multidrug resistance in cancer: role of ATP-dependent transporters". Nat. Rev. Cancer. 2 (1): 48–58. doi:10.1038/nrc706. PMID 11902585. ^ Cho S, Lu M, He X, Ee PL, Bhat U, Schneider E, Miele L, Beck WT (December 2011). "Notch1 regulates the expression of the multidrug resistance gene ABCC1/MRP1 in cultured cancer cells". Proc. Natl. Acad. Sci. U.S.A. 108 (51): 20778–83. Bibcode:2011PNAS..10820778C. doi:10.1073/pnas.1019452108. PMC 3251103. PMID 22143792. ^ Alberici A, Moratto D, Benussi L, Gasparini L, Ghidoni R, Gatta LB, Finazzi D, Frisoni GB, Trabucchi M, Growdon JH, Nitsch RM, Binetti G (October 1999). "Presenilin 1 protein directly interacts with Bcl-2". J. Biol. Chem. 274 (43): 30764–9. doi:10.1074/jbc.274.43.30764. PMID 10521466. ^ Tesco G, Kim TW, Diehlmann A, Beyreuther K, Tanzi RE (December 1998). "Abrogation of the presenilin 1/beta-catenin interaction and preservation of the heterodimeric presenilin 1 complex following caspase activation". J. Biol. Chem. 273 (51): 33909–14. doi:10.1074/jbc.273.51.33909. PMID 9852041. ^ Kang DE, Soriano S, Frosch MP, Collins T, Naruse S, Sisodia SS, Leibowitz G, Levine F, Koo EH (June 1999). "Presenilin 1 facilitates the constitutive turnover of beta-catenin: differential activity of Alzheimer's disease-linked PS1 mutants in the beta-catenin-signaling pathway". J. Neurosci. 19 (11): 4229–37. PMID 10341227. ^ Murayama M, Tanaka S, Palacino J, Murayama O, Honda T, Sun X, Yasutake K, Nihonmatsu N, Wolozin B, Takashima A (August 1998). "Direct association of presenilin-1 with beta-catenin". FEBS Lett. 433 (1–2): 73–7. doi:10.1016/S0014-5793(98)00886-2. PMID 9738936. ^ Tanahashi H, Tabira T (February 1999). "Isolation of human delta-catenin and its binding specificity with presenilin 1". NeuroReport. 10 (3): 563–8. doi:10.1097/00001756-199902250-00022. PMID 10208590. ^ Zhang W, Han SW, McKeel DW, Goate A, Wu JY (February 1998). "Interaction of presenilins with the filamin family of actin-binding proteins". J. Neurosci. 18 (3): 914–22. PMC 2042137. PMID 9437013. ^ Nielsen AL, Holm IE, Johansen M, Bonven B, Jørgensen P, Jørgensen AL (August 2002). "A new splice variant of glial fibrillary acidic protein, GFAP epsilon, interacts with the presenilin proteins". J. Biol. Chem. 277 (33): 29983–91. doi:10.1074/jbc.M112121200. PMID 12058025. ^ Levesque G (1999). "Presenilins interact with armadillo proteins including neural-specific plakophilin-related protein and beta-catenin". Journal of Neurochemistry. 72: 999–1008. doi:10.1046/j.1471-4159.1999.0720999.x. PMID 10037471. ^ Annaert WG, Esselens C, Baert V, Boeve C, Snellings G, Cupers P, Craessaerts K, De Strooper B (November 2001). "Interaction with telencephalin and the amyloid precursor protein predicts a ring structure for presenilins". Neuron. 32 (4): 579–89. doi:10.1016/S0896-6273(01)00512-8. PMID 11719200. ^ Buxbaum JD, Choi EK, Luo Y, Lilliehook C, Crowley AC, Merriam DE, Wasco W (October 1998). "Calsenilin: a calcium-binding protein that interacts with the presenilins and regulates the levels of a presenilin fragment". Nat. Med. 4 (10): 1177–81. doi:10.1038/2673. PMID 9771752. ^ Kashiwa A, Yoshida H, Lee S, Paladino T, Liu Y, Chen Q, Dargusch R, Schubert D, Kimura H (July 2000). "Isolation and characterization of novel presenilin binding protein". J. Neurochem. 75 (1): 109–16. doi:10.1046/j.1471-4159.2000.0750109.x. PMID 10854253. ^ Haffner C, Frauli M, Topp S, Irmler M, Hofmann K, Regula JT, Bally-Cuif L, Haass C (August 2004). "Nicalin and its binding partner Nomo are novel Nodal signaling antagonists". EMBO J. 23 (15): 3041–50. doi:10.1038/sj.emboj.7600307. PMC 514924. PMID 15257293. ^ Baulac S, LaVoie MJ, Kimberly WT, Strahle J, Wolfe MS, Selkoe DJ, Xia W (November 2003). "Functional gamma-secretase complex assembly in Golgi/trans-Golgi network: interactions among presenilin, nicastrin, Aph1, Pen-2, and gamma-secretase substrates". Neurobiol. Dis. 14 (2): 194–204. doi:10.1016/S0969-9961(03)00123-2. PMID 14572442. ^ Gu Y, Chen F, Sanjo N, Kawarai T, Hasegawa H, Duthie M, Li W, Ruan X, Luthra A, Mount HT, Tandon A, Fraser PE, St George-Hyslop P (February 2003). "APH-1 interacts with mature and immature forms of presenilins and nicastrin and may play a role in maturation of presenilin.nicastrin complexes". J. Biol. Chem. 278 (9): 7374–80. doi:10.1074/jbc.M209499200. PMID 12471034. ^ Lee SF, Shah S, Li H, Yu C, Han W, Yu G (November 2002). "Mammalian APH-1 interacts with presenilin and nicastrin and is required for intramembrane proteolysis of amyloid-beta precursor protein and Notch". J. Biol. Chem. 277 (47): 45013–9. doi:10.1074/jbc.M208164200. PMID 12297508. ^ Yu G, Nishimura M, Arawaka S, Levitan D, Zhang L, Tandon A, Song YQ, Rogaeva E, Chen F, Kawarai T, Supala A, Levesque L, Yu H, Yang DS, Holmes E, Milman P, Liang Y, Zhang DM, Xu DH, Sato C, Rogaev E, Smith M, Janus C, Zhang Y, Aebersold R, Farrer LS, Sorbi S, Bruni A, Fraser P, St George-Hyslop P (September 2000). "Nicastrin modulates presenilin-mediated notch/glp-1 signal transduction and betaAPP processing". Nature. 407 (6800): 48–54. doi:10.1038/35024009. PMID 10993067. ^ Stahl B, Diehlmann A, Südhof TC (April 1999). "Direct interaction of Alzheimer's disease-related presenilin 1 with armadillo protein p0071". J. Biol. Chem. 274 (14): 9141–8. doi:10.1074/jbc.274.14.9141. PMID 10092585. ^ Mah AL, Perry G, Smith MA, Monteiro MJ (November 2000). "Identification of ubiquilin, a novel presenilin interactor that increases presenilin protein accumulation". J. Cell Biol. 151 (4): 847–62. doi:10.1083/jcb.151.4.847. PMC 2169435. PMID 11076969. Cruts M, Hendriks L, Van Broeckhoven C (1997). "The presenilin genes: a new gene family involved in Alzheimer disease pathology". Hum. Mol. Genet. 5 Spec No: 1449–55. doi:10.1093/hmg/5.Supplement_1.1449. PMID 8875251. Cruts M, Van Broeckhoven C (1998). "Presenilin mutations in Alzheimer's disease". Hum. Mutat. 11 (3): 183–90. doi:10.1002/(SICI)1098-1004(1998)11:3<183::AID-HUMU1>3.0.CO;2-J. PMID 9521418. Larner AJ, Doran M (2006). "Clinical phenotypic heterogeneity of Alzheimer's disease associated with mutations of the presenilin-1 gene". J. Neurol. 253 (2): 139–58. doi:10.1007/s00415-005-0019-5. PMID 16267640. Wolfe MS (2007). "When loss is gain: reduced presenilin proteolytic function leads to increased Aβ42/Aβ40. Talking Point on the role of presenilin mutations in Alzheimer disease". EMBO Rep. 8 (2): 136–40. doi:10.1038/sj.embor.7400896. PMC 1796780. PMID 17268504. De Strooper B (2007). "Loss-of-function presenilin mutations in Alzheimer disease. Talking Point on the role of presenilin mutations in Alzheimer disease". EMBO Rep. 8 (2): 141–6. doi:10.1038/sj.embor.7400897. PMC 1796779. PMID 17268505. This page was last edited on 12 February 2019, at 18:47 (UTC).